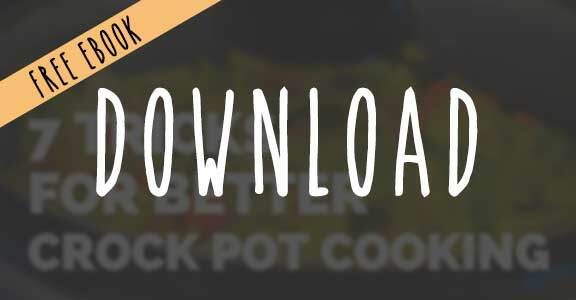 This comforting and healthy Crock Pot recipe will make you all warm and fuzzy inside without feeling weighed down by heavy ingredients. 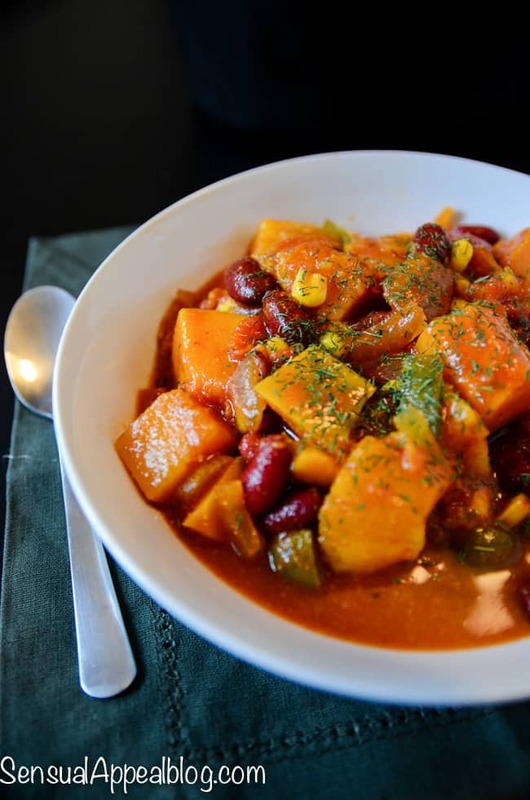 This Vegan Crock Pot Butternut Chili is a fantastic way to warm up on a chilly evening. Delicious! I am patting myself on the back for actually making real meals. The transition into adulthood has not been as smooth for as as for others in terms of eating but I’m adapting and I’m happy to say I’m getting in the flow of things. One of the things that have made the transition easier are healthy crock pot recipes (this and this) I’ve been making lately. Like this Vegan Butternut Chili, for example. It’s my first time making “chili” although I know it isn’t the typical traditional chili you’re used to. The thing is, I didn’t try my first chili until I went to college and I had it in our dorm cafeteria! I know, I know. Chili is not something we had in Poland and that’s why it was until I was 19 that I got to try this hearty warming stew. It was very good but it was also pretty darn salty. I wasn’t surprised though since most American soups are WAY over the top with the salt. Meh. As a person who barely uses salt, you can imagine how sensitive my tastebuds are to salty flavors. Like, way sensitive. Salt central. I needed to make my own chili so I could actually make it the way I like it! So fast forward 4 years later, I’m living in my own apartment and I have a love affair with my Slow Cooker and we made a baby – Vegan Butternut Chili. To embrace the fabulous seasonal ingredient in the form of squash and making the recipe not only healthier but also CHEAPER (meat is expensive as heck! 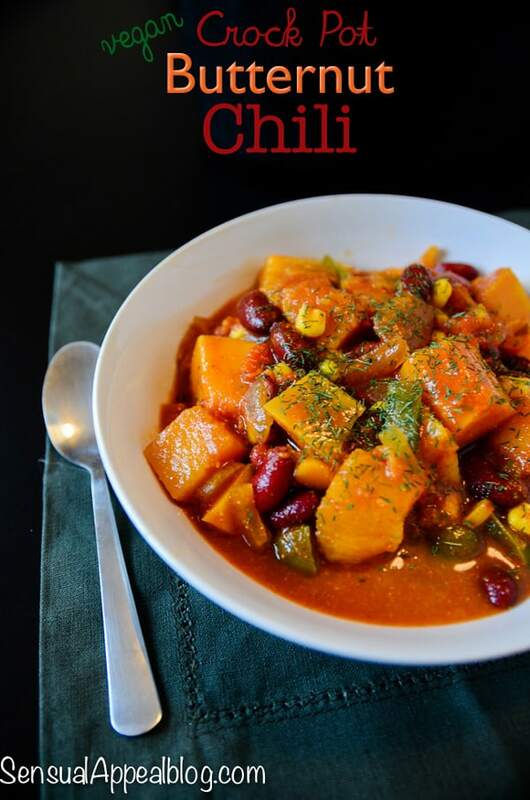 ), this healthy chili is a perfect dinner or lunch option. Kammie, this sounds AWESOME!! 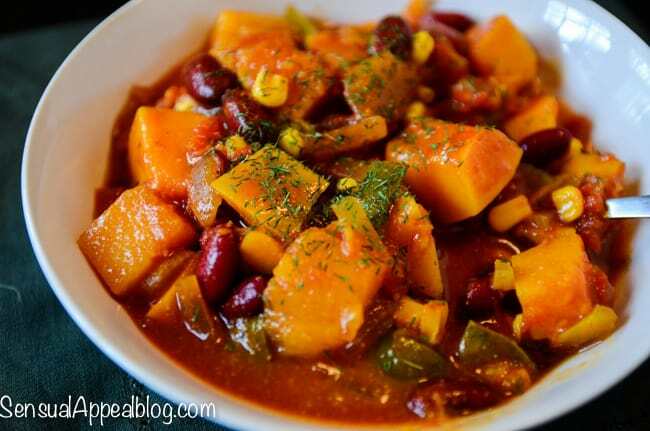 I looooove butternut squash, and chili, and my crockpot! I need to make a batch of this asap! This looks awesome and so colourful! I adore butternut squash but never used it in chilli, it’s the perfect combination! This looks really tasty and healthy too. Perfect for fall. This chili looks amazing! I love how using butternut squash in chili gives it a wonderful sweet/spicy contrast! This looks delicious! My brother is vegan so I’m always trying to come up with new meal ideas for when he visits. This one is next on my list! Yay, he will not be disappointed an neither will anyone else. You can’t even tell this is vegan! It’s so good. Amazing! The squash melted and made the chili thick and delicious. Don’t think the kids would have eaten chunks of squash, so it was perfect. I did add a bit of leftover Italian sausage, but it would have been great without it. I have a Crock pot of this cooking right now! Yum! Delicious! I’m going to blog it this weekend – I’ll link back to you as the original poster, if that’s ok?? This looks delicious! Thanks for sharing. I will be making this this weekend for sure.